This tutorial shows you how to create a realistic 3D fruit bowl illustration with the new Adobe Illustrator CS2 feature: 3D Revolve Effect. Create a path and fill it with yellow like the image below. Then, select Effect > 3D > Revolve from the menu. Click on More Options if the lower portion of the window is not showing. Create a new light by clicking on the New Light icon and drag the two lights as shown. Change Shading Color to orange by: selecting Custom from the drop drop, click on the sample color box to open the Color Picker window, then enter this color values – R=255 B=50 G=0. If you want a smooth blending, increse the Blend Steps (default is 25, max is 256). Note: increase Blend Steps will increase file size and memory usage. Keep the apple path selected, go to Effect > Stylize > Drop Shadow and apply the setting as shown below. First create a path similar to the image below, fill it with black (k=100), and then create the highlight path and fill it with 80% black (k=80). Drag it to the Brush library window to create a New Art Brush. If your Brush library is not on the screen, go to Window > Brushes or press F5. The Art Brush Option window should pop out, select Tints from the Colorization Method drop down menu, leave everything as default, and click OK. Create a stroke path with the Pen Tool and select the Art Brush that you have created in the previous step. Now place it on top of the apple like the image shown below. Select the apple (with stem), hold down the ‘Alt‘ (or ‘Option‘ key for Mac), drag it to make a copy of it. You may also use Copy & Paste to duplicate the apple. Then, change it to red. Select the red apple (oval path only). In the Appearance pallate, double click the 3D Revolve effect icon to adjust the options/setting. If the Appearance window is not showing, go to menu and click on Window > Appearance or press Shift+F6. Now the 3D Revolve Option window should pop-out. Enter the following values: X=57, Y=63, Z=-159. You can change the rotation values manually by entering the numbers or by dragging the cube on the left. Notice hot the stem’s position is slightly off after you have rotated the apple. Move the stem stroke to the center of the apple by using the Selection Tool or Direct Selection Tool. Make more apples by repeating Step 7 to 9. 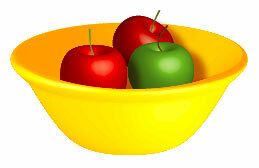 Put the apples and the bowl together as shown. Draw an oval shape path, base on the shape of the bowl.